Police accuse a New Jersey woman of suffocating to death four five-week-old American Bulldogs by stuffing them in a cooler. 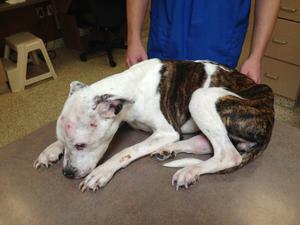 A Massachusetts resident finds a lifeless young Pit Bull near a Quincy park. “Puppy Doe,” as she is called, has so many broken bones and stab wounds, is so malnourished and weak, that veterinarians can’t save her. A night-time break-in at a Georgia shelter leaves three dogs dead and fifteen injured. Police say it’s possible that the shelter’s dogs were attacked by dogs brought in by people involved in dog fighting, who wanted to prep their dogs for future fights. I read about each of the above heartrending cases in the past several weeks. The stories are hard to stomach. I’d love to write that they are unique, aberrations. But they are not. Dogs are the victims of abuse and cruelty more often than any other animal, according to Pet-Abuse.com. They deserve so much better. These stories got me thinking about a foundation started in September by Leigh Ann Errico, a friend of a friend. The kidkind foundation and its companion website, www.wearthecapekids.com, are committed to making our communities better places to live, by “restoring the power of kindness and good character.” Errico, the mother of four, writes she’s been disheartened by “the seemingly never-ending string of jaw-dropping news stories,” of incivility, of cyber-bullying, of people treating others in ways they would never want to be treated themselves. The idea behind “Wear the Cape” is that “we are all everyday heroes, or at least capable of being heroes by doing the right thing, the kind thing, the helping and inclusive thing.” Dogs wear the cape every day: They love us, protect us, are our most loyal friends and trusted teachers. And they do all of this unconditionally. Perhaps one of their greatest gifts is that dogs help parents raise children in ways that benefit all of society. 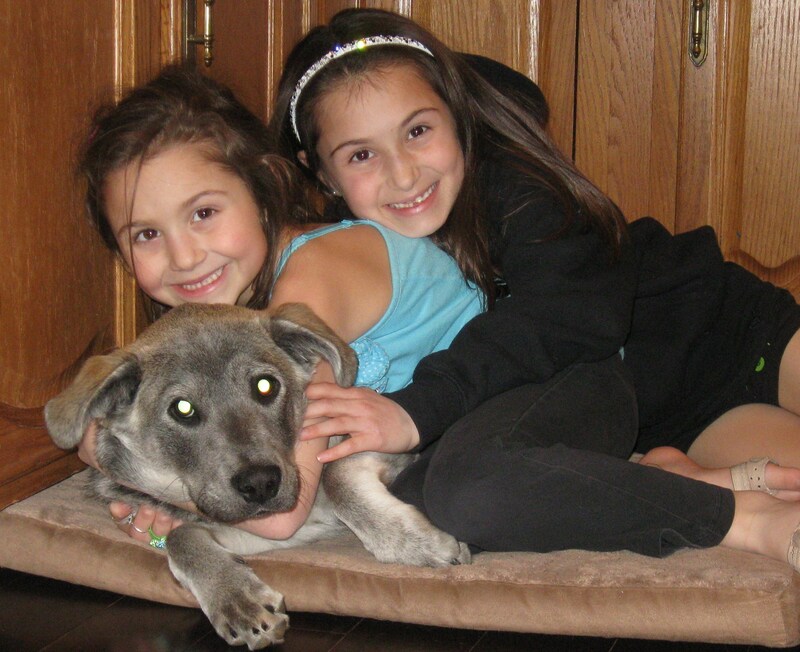 Here’s how: Researchers investigating the human-animal bond routinely find that children who grow up with a dog have greater compassion, tolerance, and empathy for others. Like so many parents, my husband and I are trying to instill empathy in our daughters. We are fortunate to have Galen to help us in this endeavor. She is there every morning to wake our girls with a cold wet nose to the face. She is there every afternoon, the first to greet them when they get off the school bus. (I remain in the house and watch from the window as their backpacks fall to the ground, smiles brighten their faces, and they drop to their knees to say hello to their tail-wagging sister who’s as thrilled to see them as they are to see her.) I see their love for Galen grow every time they pet her, kiss her, talk to her. And she never fails to return the affection. Just as dogs are our heroes, we need to be theirs. And that leads me to one other story I read this past week: A two-year-old Pit Bull riddled with bullets was left to die on an Arizona mountain trail. A female hiker found the dog and carried its limp, 47-pound body down the mountain, saving its life. She named the dog Elijah, and her family is now fostering him. This entry was posted in dog fighting, dogs, fostering, Galen, Georgia, pit bulls, shelter. Bookmark the permalink. Individuals, for I can’t call them human beings, will continue to do these horrific things to dogs and other animals because the laws that “protect” these animals are not severe nor harsh enough to fit the crime. I looked at the picture of that poor pitbull and it really touched me. I am looking forward to working, in the very near future, with an organization here in MD regarding obedience training. I’ll be a certified dog trainer soon, and part of my programs requires me to work with an organization such as a shelter, rescue, etc., but I’ll be doing it not only because it is required, but rather because I know I can help so many dogs in need. Marcela, the picture of that little Pit just breaks my heart, too. People can be just unimaginably cruel. Best of luck with your dog training and shelter/rescue work. You will be so appreciated by the dogs you give a little love to. Thanks. I think that I get more from them that I give them, but every little bit helps. I am really excited and itching to get started. That picture made me cry for I cannot believe that a so called “human” could do that to another living, breathing, being.